Courteney Cox is seen in Los Angeles, California. A pair of navy espadrille wedges added a summery touch. 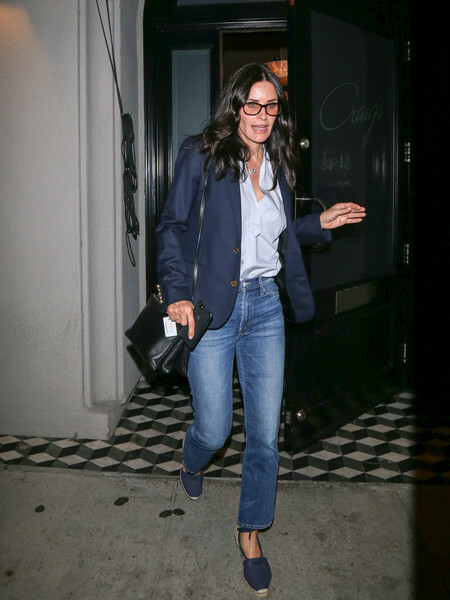 Courteney Cox looked smart in a navy blazer layered over a pastel-blue shirt while enjoying a night out at Craig's. Courteney Cox went super casual on the bottom half with a pair of classic jeans. Courteney Cox finished off her ensemble with a black leather shoulder bag.